Beware: there is another page on Aristotélēs in this website, dealing with his philosophy of opposition more broadly. The present page will be more focussed on his work preparing the logical square, notably by his discovery of the difference existing between contrariety and contradiction. 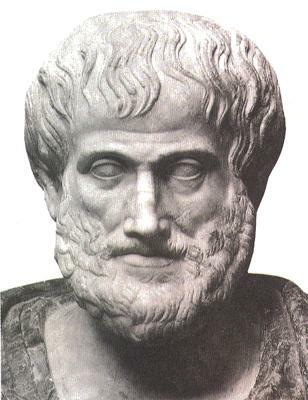 Aristotélēs (Ἀριστοτέλης) is the founder of the logic underlying the logical square (or square of opposition). However, the first known explicit reference to the geometrical structure is to be found centuries later in the writings of Apuleius and Boethius. Aristotle’s own explicit definitions allow to construct a structure (ancestor of the square), highlighted among others by T. Parsons, which we proposed to call an “anti-gamma scheme” (because of its very shape: an upside-down “gamma”). Parsons showed that it is rather straightforward to deduce, from the Aristotelian anti-gamma, the logical square. Note that contemporary logic tends to consider that the square structure does not reflect the actual logical knowledge, better represented by a structure which we propose to call (because of its very shape) “X-scheme”. One of the first historical known representations of the logical square is the following. An important point to be remarked is that in Aristotélēs’s philosophical work there is a clear hesitation between two concepts of “possible”, which gives rise to two distinct geometrical-logical models: the square (of opposition) or a triangle (of contrariety). This hesitation is study with textual accuracy by Brunschwig (1969) who shows that implicitely Aristotélēs hesitates between three logical squares. But this hesitation, resolved neither by Aristotélēs nor by his followers, will be fully explained and resolved (as Brunschwig himself recognises in 1969) by the discovery, by Jacoby (1950), Sesmat (1951) and Blanché (1953), of the logical hexagon). This discovery will turn out hugely important for OG: it will open a new mathematical world.